A delicate illusion set diamond solitaire, set on the diamond set shoulders of a 9ct white gold ring. An elegant ring, perfect for engagement. 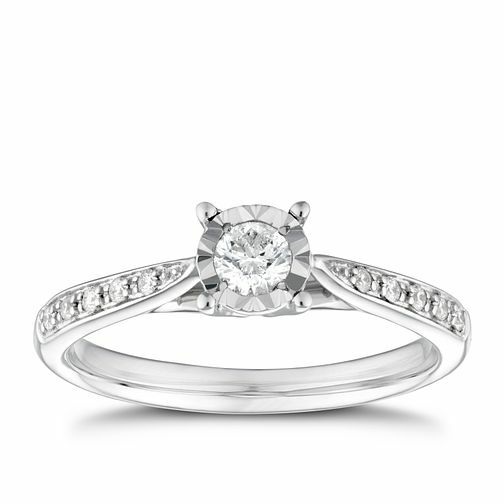 9ct white gold third of a carat diamond solitaire ring is rated 4.8 out of 5 by 5. Rated 5 out of 5 by Anonymous from Love! My fiance is from England and I am Canadian, he proposed to me with this ring, and I was stunned at the beauty! The illusion setting is something I have never seen but love. It is so sparkly and I always catch myself looking at it! Just beautiful!! Now to find the right wedding band to go with! Rated 4 out of 5 by Anonymous from Lucky woman I was looking for a nice stylish modern looking ring and this one caught my eye straight away. It looks more spectacular in the flesh if you know what I mean. And looks more expensive. I have only rated this ring 4 out of 5 ,good, because the Mrs hasn't seen it yet, I'm not proposing until Christmas Day,(she lives for Christmas). So I'll find out if she likes it then, I'm sure she will, fingers crossed. Anyway I highly recommend it and hope all you lucky women get swept off your feet and have a ring like this on your finger one day. Hope my post help, ciao for now.